The 2025 movement is gathering strength in its bid to tackle avoidable health inequalities in North Wales. Paul Diggory reports on the latest developments. The need to achieve more synergy between housing and health has long been a challenge too far, but better results have emerged more recently through people taking more innovative approaches. You may recall an article in WHQ last year (In the Year 2025) describing the efforts going on in North Wales. It’s encouraging to hear Project Management Group (PMG) chair Clare Budden say: ‘What started from four angry people in a bar has grown into a movement now of almost 200 members.’ And it’s that word ‘movement’ that’s key here. At an event just over a year ago, people gelled over a common desire to tackle avoidable health inequalities by 2025, whether their background was housing, health or social care, whether they were a senior manager or a frontline practitioner. This was the birth of the 2025 movement. Bringing together a wide range of professionals from housing, health and social care, it was evident that life expectancy and the quality of life in certain neighbourhoods and social housing remains significantly lower. This is a point of real anger felt by all involved in 2025 that this exists on their watch and a common desire to do something different has driven efforts. There was strong support for the view that traditional single profession management solutions had failed and that real leadership action is required across all systems. This early acceptance of a ‘do something, do it anywhere and do it now’ philosophy has been embraced through systems leadership. The 2025 brand was owned by everyone and was neither area- nor profession-specific, but every day reminds participants of their deadline. The September conference put some data behind the passion and achieved sign-up by individuals to just do something toward addressing avoidable health inequalities. Focus on defining the areas of action has taken time but they’ve been agreed and the real ache for action has led to recent changes around governance and the establishment of simple project management architecture. At an all-Wales level a Memorandum of Understanding has been agreed between national trade and professional bodies which sets the context for 2025 work and against this backdrop the 2025 Bond was agreed in May. All of this has been achieved at a very low cost with no additional funding. 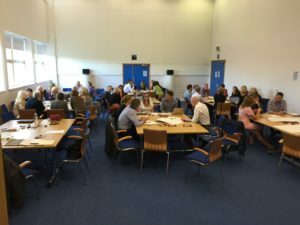 The challenge now is to put in place a small investor style membership from housing associations, local councils, Betsi Cadwaladr University Health Board (BCUHB) and Public Health Wales. As Vice Chair of BCUHB and now PMG, Margaret Hanson was one of those four people in the pub and says her early vision for 2025 was always ‘an army of thinking practitioners’. Having so many different professionals from so many backgrounds is a real strength but leading collaboratively is a bit of an art. Enter Debbie Sorkin, national director of Systems Leadership at The Leadership Centre. Having inspired participants at the first conference, Debbie’s recently been back to help the newly established PMG. ‘Organisational structures and different cultures can form barriers to systems leadership,’ according to Debbie, but the 2025 team are determined to avoid this. Their approach is split between strategic planning and leadership and a number of ‘Just Do’ teams to ensure that real progress is made in delivering change. The teams are covering a variety of service provision and geographic areas including place-based health-led regeneration; hospital discharge delay; homelessness; healthy living; mental health and wellbeing. The development of excellent problem definitions was a key first stage priority for teams so that the 2025 PMG is able to consider and agree where it can add value either by supporting what was already in place or by starting something new where nothing existed to tackle the problem. The PMG comprises representation from across the breadth of the movement. The group’s focus is now on whole movement community development and relationship management. To that end another gathering of all members is planned for December. The venue will again be the Optic Centre at St Asaph and sponsorship is being actively sought. There’ll be a lot of information sharing and much discussion but one thing’s for certain – it’ll be action-oriented. There are only nine years to go!